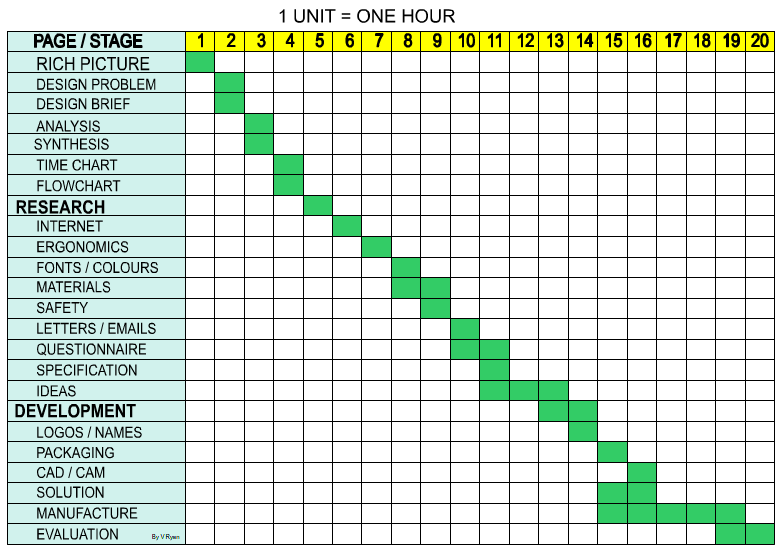 A Time Chart is a way of planning your project. Below is a simple grid and the stages of the design process are listed down the left hand side. As part of your project you need to show how much time you intend to spend on each section of the project. Included is a key which shows the amount of time that each unit represents. When you devise your time chart you may wish to include all the sections involved in research or add sections that apply to your individual project. The time chart shown above is a basic layout. When attempting a graphics project you will need to draw it in a more imaginative way. 1. The example shows the stages/pages of design listed on the left hand side. You may decide to set the stages out in a different way. However, you still need to list all pages/stages. 2. On your time chart you must clearly show how much time has been allocated to each stage. 4. Consider including additional pages/stages that only apply to your project. This may apply especially to the research section of your project. 5. Keep the pages/stages to between 25 - 30 in number. 6. You may want to leave blank areas for pages/stages that you may include later. For example, You may be considering making a small model near the end of the project. One page could be set aside for photographs of its construction. 7. It is possible to produce two time charts. The first will represent the designing and the second the manufacturing and all the stages of making. 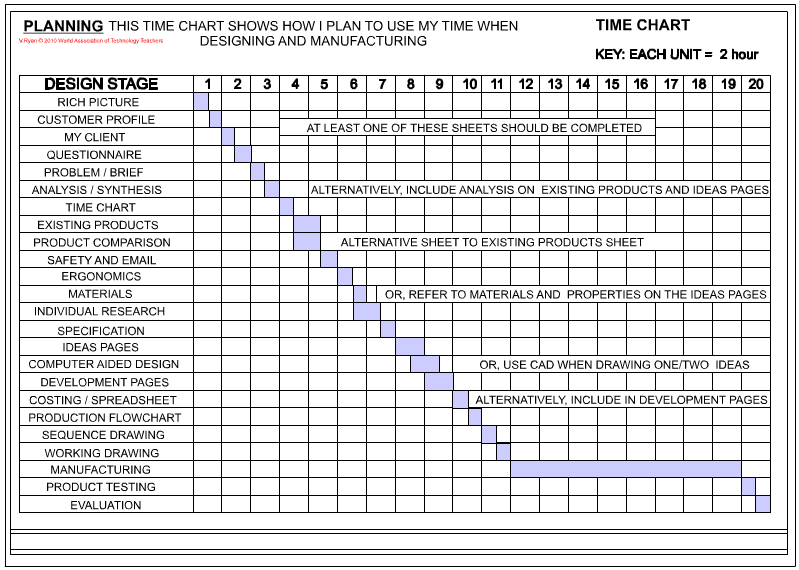 If this is the case, the designing time chart can be drawn early in the project and the manufacturing time chart near the end. 8. The time chart must be easy to follow. Keep the layout simple but add colour and shade to enhance it. 9. If you have been told that there are a limited number of hours for your project - the total hours represented on your time chart should add up to this. A. On paper list all the pages / stages you intend to include in your design folder. B. List all the stages of manufacturing, if you know them at this stage. You may wish to have one stage representing all the aspects of making (as seen on the example above). Plan a time chart for a project of your choice. Remember to allow time for each section of the project.